I may have a bit of a problem. Well, an addiction really. I just can’t help it. I am obsessed with tea cups. There. I said it. Yes, maybe it’s a little pathetic, and I’m sure you may be shaking your head at me. 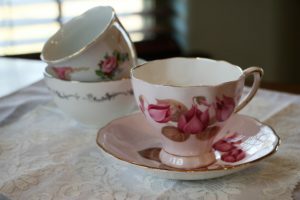 Even I find it a bit alarming that not only am I sitting here writing a blog about teacups, but I actually spent time this afternoon taking photos of some of my favorite ones. 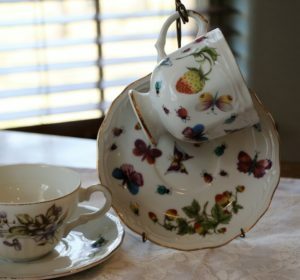 So I may not understand it, but I have to say that finding a delicate, beautiful, elegant tea cup at a thrift store is a very simple thing that brings me such joy. 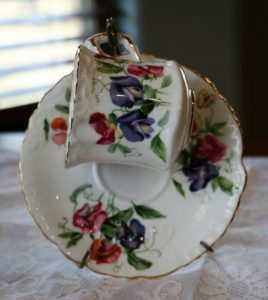 And if there is a matching saucer for that treasure…well, don’t get me started! I recently pulled out a stash of my favorite cups and saucers to share at a baby shower. It delighted me so much when a few people commented on the unique beauty of each cup, while carefully selecting which one to use. Then there were others who seemingly didn’t notice that the cup they were drinking from is a special creation. Being that I am somewhat philosophical, I started thinking about why some people appreciated my lovely cups and others took no notice. And taking that a step further, why am I so intrigued and drawn to teacups? Let me back up a bit and tell you where my obsession began. 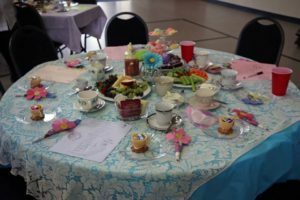 I volunteer for a wonderful girls’ ministry, and we host a Mother-Daughter Tea Party annually for Mother’s Day. The first year, we expected over 100 to attend, and I was determined that each guest would have a real cup (no plastic or paper) to drink from. So I spent months scouting out thrift stores and garage sales collecting cups. I have become much more discerning, only purchasing the prettiest cups with matching saucers. Just about everywhere I go, I am on the lookout for a new antique or thrift shop that certainly has a hidden treasure inside with my name on it. At these tea parties, you can imagine how much the girls LOVE it. It’s so fun to watch them as they arrive and see the beautifully decorated tables. They walk around, carefully selecting where they will sit based on the cup at each place. You see, little girls care about having a pretty cup. Much like they don’t ever seem too busy to stop and admire a pretty flower. With this thought in mind, I looked at my collection of cups through the eyes of a child. To me, teacups represent time. It takes time to properly make a cup of tea: you have to boil water (no microwaving, it doesn’t stay hot long enough and it is just plain bad for you,) you have to wait for the tea to steep, and then you have to take your time and sip it slowly so that you don’t burn yourself. In this way, a cup of tea helps me to remember to pause and slow down a little bit. I especially like to have my tea when I’m settling down with a good book or to savor during my prayer time. Teacups also represent togetherness. Granted, I drink plenty of tea by myself, but it somehow tastes better when shared with friends or loved ones. There’s just something about sharing a cup of tea that makes time spent together just a little more meaningful. And in my personal opinion, this is even more true if the cup happens to be beautiful.